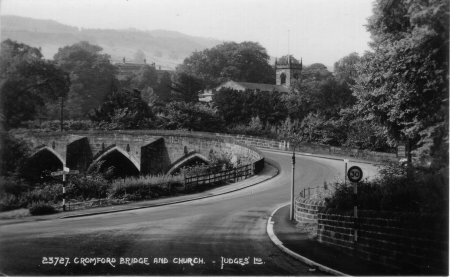 Cromford Bridge and St Mary's Church..
Unposted. 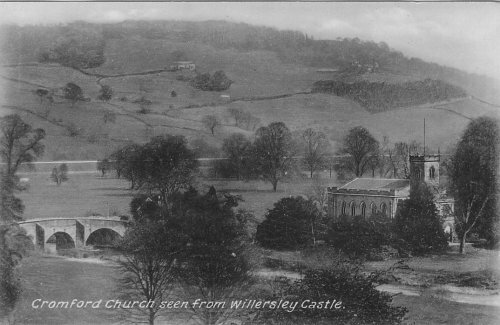 Track to Willersley Castle on the right. 15th C pointed arches on the East (downstream) side, with the Church tower behind. 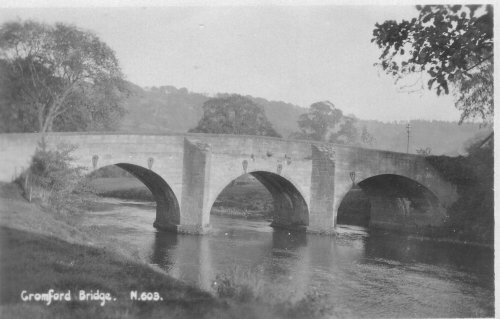 An undated close-up of the East side of the bridge. 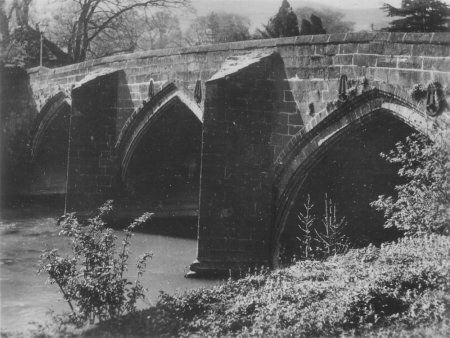 Rounded arches on the West (upstream) side, built when the bridge was widened. 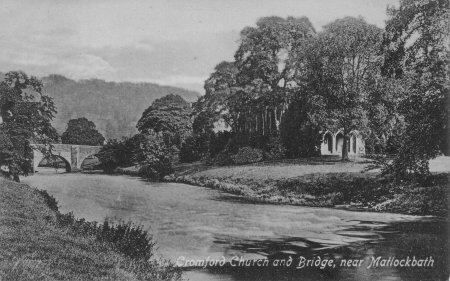 Cromford Bridge and Church, photo taken from Willersley Castle. 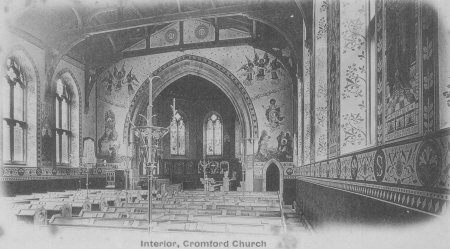 St Mary's was built in 1797 as a chapel of ease due to the rapid expansion of Cromford. Sir Richard Arkwright built the world's first water-powered cotton spinning mill nearby in 1776, and new houses for the workers. 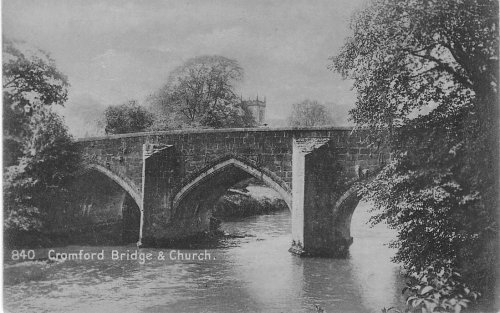 The bridge was built in the 1400s. 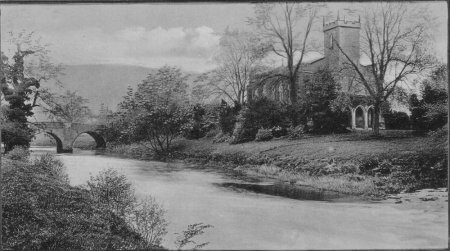 In the background is the railway embankment. Arkwright's canal finishes at Cromford wharf, just behind the Church. 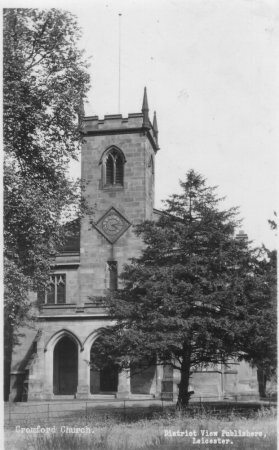 The postcard is published by Charles Colledge, Smedley St, Matlock. "THE LEAP OF MR B H MARE JUNE 1697"
There are many theories about what this means, my own is given below. For others, see Cromford Village in Derbyshire.